These amazing little bar cookies come together in minutes and are reminiscent of a Twix bar and a Turtle candy. Keep reading to see how easy they are to make! We set out with intent each day, going down our lists, getting the required things done in hopes of getting to have a little time to do the things we’d like to fit in as well. I start my day before the sun comes up with such great aspirations but they seem to always be a bit beyond my actual ability to accomplish. I guess I set the bar high. This time of year, especially, my to-do list triples and I have to remind myself to set aside sacred time for rest. My husband and I had been doing really well with that but the past two or three weeks have sped by and we neglected to jump off the train so we just kept on speeding with it. This morning, in the wee hours of the day as we sat and drank our coffee before setting about getting started, we both talked about our determination to hop off that crazy train at the end of this week and take some time to ourselves. And that is what we are focusing on this entire holiday season – the moments, the people, and the blessings that are already in our lives. This season looks very different at our house this year, unlike any other my family has ever experienced, and it is that way by prayerful design. You ever step outside in the middle of a winter’s night and just listen to the stillness? Part of why it is so quiet is because you have stopped moving as well. I wonder how many still and peaceful nights we have lost in our lives because of our own noise. How many whispers we have missed, how many moments we have stomped through. It’s not just okay to slow down, it’s required, and if you live according to the Word, commanded. So don’t feel guilty for taking time, if there is guilt to be felt it should be over not taking time. At the end of the day though, do the best you can, and rely on God to fill in where you fall short. With that in mind, I’m sharing a recipe that tastes labor intensive but only requires a few total minutes of your time – so you can spend the bulk of your time recharging. 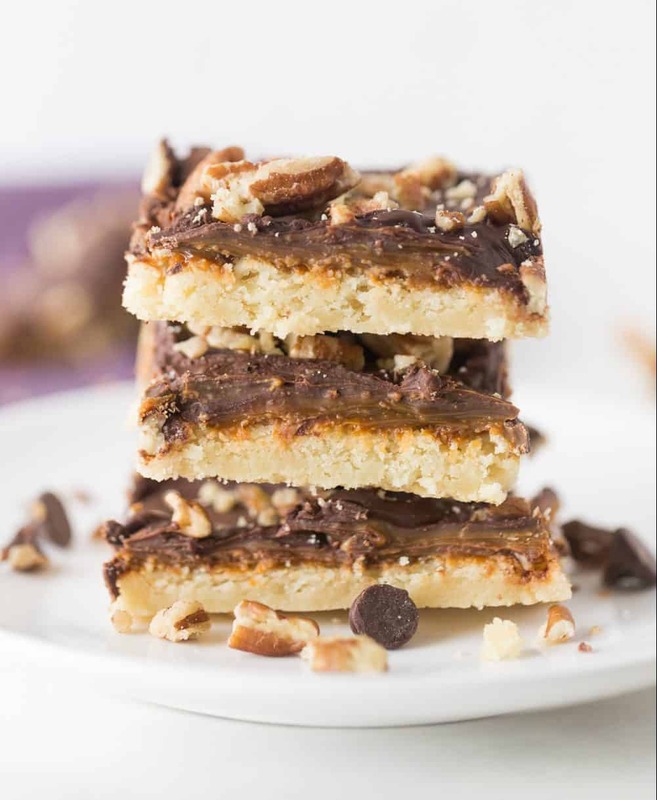 I had a hard time coming up with a name for this recipe because it resembles two different loves in my life: Twix Bars and Turtles. In the end, I decided to keep my life easier and not name it after a copyrighted candy bar :). 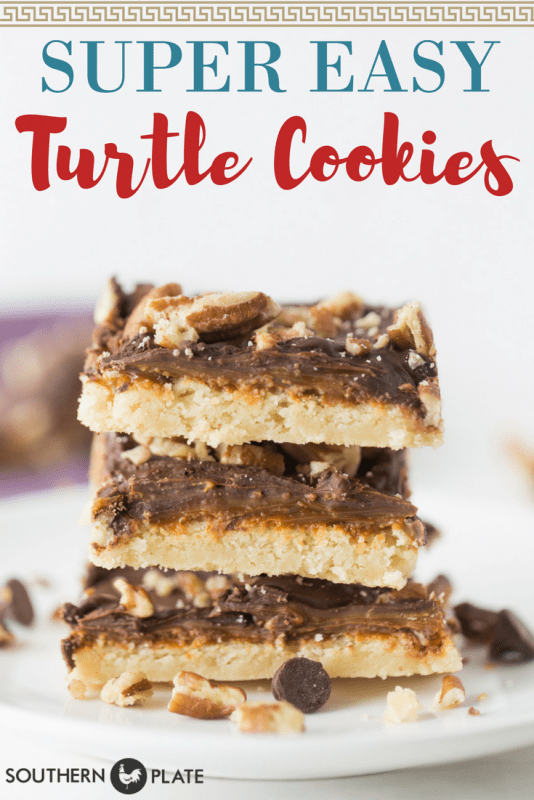 So Turtle Cookie Bars, it is! If you have anyone who is allergic to nuts or if you’d like to make this recipe WAY more affordable, feel free to leave those out. I usually do, mainly due to the expense (for the price of a bag of pecans I could cook an entire supper for my family). 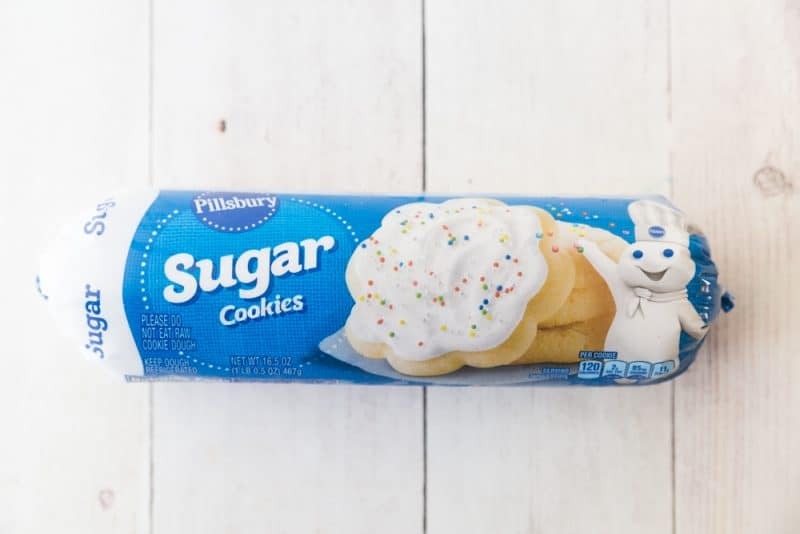 This recipe is all about being delicious and easy, so let’s start with a roll of sugar cookie dough. Your favorite brand or store brand is fine. You’ll also need: Chocolate Chips, Dulce de Leche, and pecans. As always the complete recipe is in printable format at the bottom of this post. Line a 9×13 baking dish with foil, being sure to leave an overhang so that you can easily pull the bars out after they are done. Spray the foil with cooking spray. Pat cookie dough out evenly into the pan and bake at 350 for about 20 minutes, or until lightly browned*. *Note, ovens vary in how fast and hot they cook. That is why you often see bake for __minutes OR until ____ in instructions. The good thing is we usually get to know our ovens and know what to expect if we use them on a regular basis but I just wanted to give you a little heads up since that came to mind. Look at this can of love and wonder! That is canned caramel and it is divine from start to finish. I used to only find it on the Mexican foods aisle but now it is often in the baking section with all of the other canned milk products as well. This is a wonderful shortcut. If you haven’t tried it in my Samoa Brownies recipe, make sure you hop over there after you’re done with this post! Yes, you can, technically, turn a can of sweetened condensed milk into caramel by boiling the can – however this is extremely dangerous, it can (and has) exploded, and I absolutely plead with you not to do that. If you just have have have to use a can of sweetened condensed milk, open the can and pour it into a bowl and microwave it at 1-2 minute intervals, stirring after each, until it turns brown and caramelizes. You don’t risk having a can explode in your face using this method. I know, I know, there are a lot of people who are going to say they have done this many times and it turned out fine but that doesn’t make the method safe, it just makes you lucky. This is my $40,000 Home Economics degree talking so now is your chance to benefit without having to take the exams or pay the tuition :). My recommendation: Give yourself permission to do things the easy way sometimes. Bee bop on over to the Mexican foods section of your grocery store and pick up a can or two of this instead. Pour the can of caramel in a microwave safe bowl and microwave it for 1-2 minutes until it is soft and spreadable. 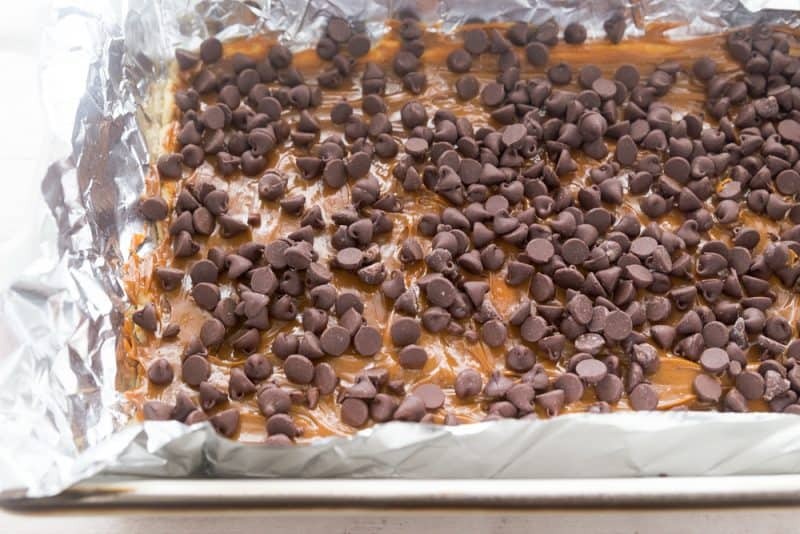 Spread it over your entire pan of cookie bars. Sprinkle the entire bag of chocolate chips over this and then place pan back in the oven for about five minutes to melt the chips. Remove from oven and spread the chips until the entire top is covered with chocolate. Sprinkle with nuts, if desired. Allow them to cool slightly and then score lines across the entire pan with a knife before allowing them to harden completely. I usually pop mine in the fridge to speed up this process. Once completely hardened, remove the cookies from the pan by pulling up on the aluminum foil and cut them all the way. Yesterday, on my “big” Facebook page I asked what everyone was having for supper. My hero, Debbie Heckler, chimed in with “Chex Mix”. I think these would count as a viable holiday season supper as well! These make excellent gifts, are great to take to office parties or bake sales, and they are sure to be appreciated by your family as well. No matter what you celebrate this season, I hope you take time to slow down and cherish as many moments as you can with your family. The real present from our families is their presence. Line a 9x13 baking dish with heavy duty aluminum foil, making sure it comes up and overhangs a bit so you can easily pull it out later. Spray this lightly with baking spray. Pat cookie dough out into the bottom of the pan to cover it. Bake at 350 for about twenty minutes, or until lightly browned. Allow to cool completely. Empty caramel into a bowl and microwave it at thirty second intervals, stirring after each, until soft and spreadable, about 1-2 minutes. Pour on top of cooled cookie crust and spread to edges. Sprinkle entire bag of chocolate chips evenly over the top of this and place it in a 350 oven until chips become soft, 3-4 minutes. Remove from oven and gently spread the chocolate so that it covers the caramel. Sprinkle pecans over the top, if desired. Allow to cool until almost hardened and then score the bars into little squares with a knife before it hardens completely. Cover and refrigerate to harden all the way. Remove bars from pan by using aluminum foil. Cut along the scored lines into little squares. Enjoy! Love this fast smarty pants recipe!! I’ve also put heath bar pieces on top instead of pecans or in addition to them. Love your food and your point of view. And your family is a joy to read about. Where does the Carmel come from? 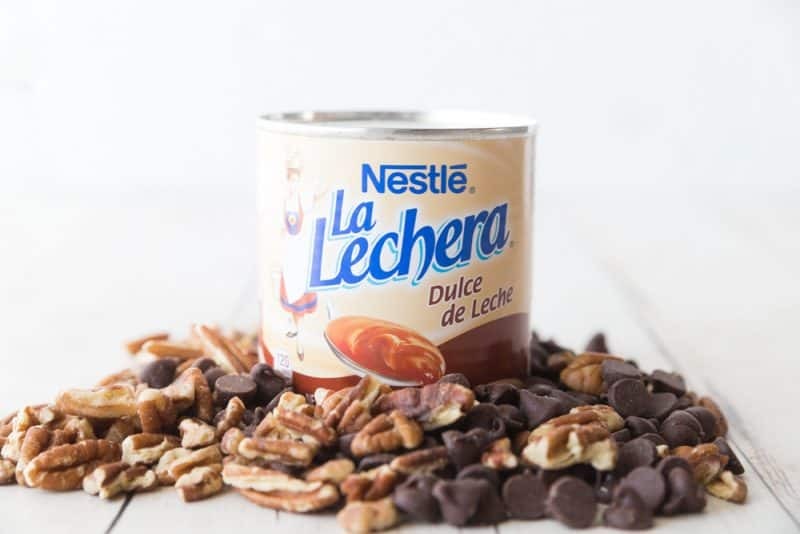 The caramel comes from the can of Dulce de Leche. 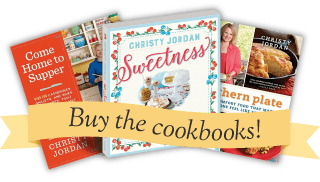 Love your recipes, Christy AND your AMAZING wit! Love this post (cookies look great too), I’ve been going out every morning to see the break of day and yesterday even the air was gold. We miss so much that God gives us by rushing around and sadly it took some bad news to a family member that made me slow down. God Bless you and your family! I too am going through a time! As my gram use to say Stop and smell the roses for one day it will be over! God is so wonderful! I hope that you have a very Merry and Blessed Christmas Pam!! Oh, these sound/look marvelous!! I’ll be making them for Christmas!!! I wonder how they would taste with butterscotch chips or by adding peanut butter chips to the chocolate? I guess I’m making three batches!!! Thanks for another winning recipe, Christy!!!!! Thank you Susan! Let me know how the variations turn out!! I forgot to come back and comment…and found it after reading your post and checking out the comments!! The variations were good, but I liked them made with chocolate best! However, my dad can’t have chocolate and he enjoyed both the butterscotch and peanut butter cookies. I will definitely be making some of this! I will have to try making it with heath candy also. Thank you for all of the great recipes! I hope you enjoy them Donna!! Let me know how the Heath bar version comes out!! Thanks for the recipe and the reminder! Merry Christmas to you Peggy!! Thank you for posting this great bar cookie recipe! Can you guide me on freezing cookies ahead of time? I simply cannot get it all done at Christmas. Are certain cookies better to freeze than others? Does icing hold up in the freezer? As you may suspect, I have never frozen a cookie before…..help! Looks delicious! Do you think these cookies would hold up well for shipping? Oh. My. Goodness. These are soooo good. This is the first time I have ever used Dulce de leche, actually the first time I’ve ever heard of it. Geez, I live in a small town not a cave! The first one I found was a squeeze bottle and after chugging it right from the bottle I knew I had to find the cans. Wal-mart (24 miles away) had it in cans. I came home and got right on these cookies and I only ate 4 when they cooled off. Quality control doncha know? I just rearranged them and was going to keep quiet, but, that dang chocolate on my lip gave me away. Love these and can’t wait to gift them. Thank you so much for changing my baking life with that wonderful little can of caramel. Looks like we might get snow this Friday in South Mississippi so, I’ll be a baking. Have a great evening. I am so glad to hear you liked them Pamela!! I hope you are having a great day, blessings to you and yours! Hi, me again. My nephew came in from his Naval base last weekend and my sister called and of course we all went to her house for a potluck for this child (when do we stop calling them children),. He loves cheesecake! So, I made this topping for the cookies on a cheesecake and oh-la-la, good thing I brought three! YUM Thanks again for making our lives so easy and so yummy. Oh my goodness, what a great idea!! I hope you had a wonderful visit, please tell him thank you so much for his service from me and my family!! How many squares did you get from this pan? It just depends on the size of your squares. You can work out how many you want and then cut a grid to match that. Ie: if you want 24, cut 8 slices across the long side and three across the top. If you want twelve, cut four across the long side and three across the top, etc. They don’t have to be stored in the fridge unless you’re going to keep them for more than a few days, it might be a good idea in that case. Merry Christmas! These are super easy. I didn’t have pecans but I remembered your faux pecan pie recipe and usd chopped pretzels and they turned out great. I don’t suppose these can’t be made gluten free. Thanks. Be waiting for a comment. 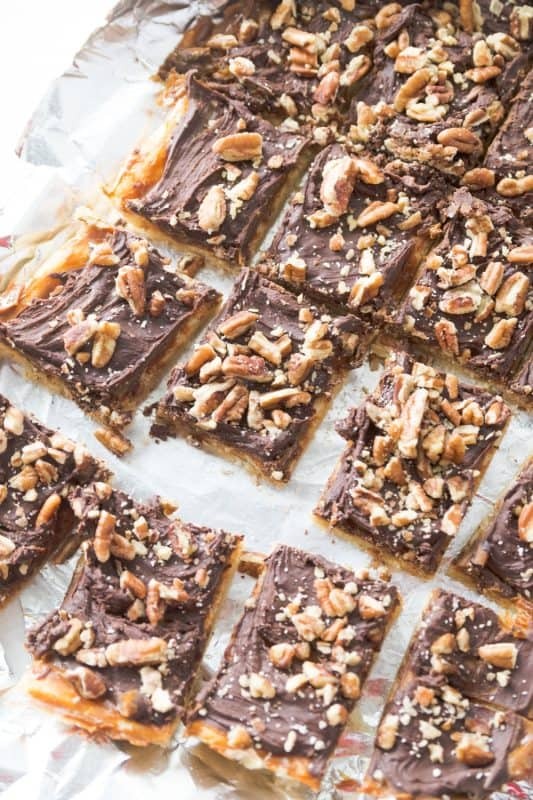 I am going to surely make these Turtle Bars….they look like they would be so delicioso. I hope you like them Kathryn, can’t wait to hear!! One or two cans of that caramel yum??? You must be joking!! Okay, I’ll admit it, I am a hoarder of Dulce de Leche and have been known to exit the store with a dozen or so cans!! Hey, a girl doesn’t want to run out or not have any available when she just has to make something containing caramel!!! Thanks for this recipe (already shared on FB)…I know I’ll be making it this Christmas!! I just love the stuffing out of you!